Mob Psycho episode 11 may very well be the best episode of the series. Of course when the opening shot is a direct homage to Akira Kurosawa’s masterpiece, Rashomon, how can you go wrong? Amazing action cuts are backed by a strong narrative, calmer moments exude the overwhelming feeling of cool with attention-grabbing framing, and a dynamic range of artistic style engrosses everyone who lays eyes on it. Episode 11 is a strong contender for my fictitious ‘Episode of the Year’ award – it embodies the very best anime has to offer. And I place the blame firmly on the shoulders of one man: Hakuyu Go. Funny thing is, we’ve all seen Hakuyu Go, and never realized it. Go did work on some of the most popular works of yesteryear; a post from the Taiwanesse website, Plurk, states he’s a Taiwaneese breakthrough artist in the anime industry who contributed a few cuts to the opening of Ping Pong under the name Boyu Wu. 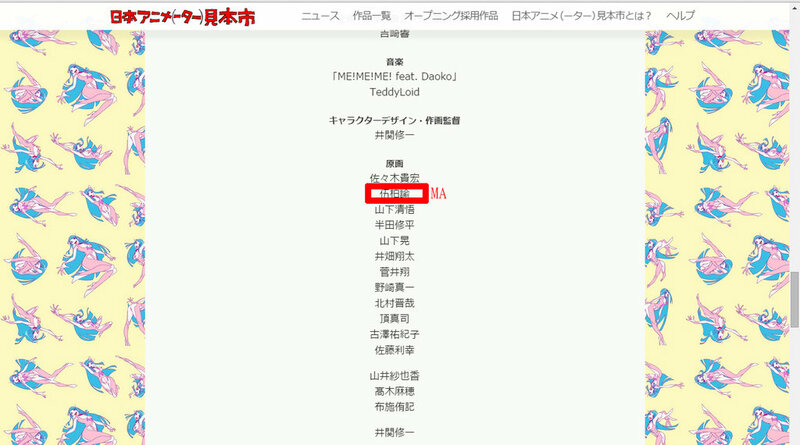 The name Boyu Wu also appears in the Animator Expo darling ME!ME!ME!, (though which cut he is thought to have contributed varies) and personal favorite of mine, Ibuseki Yoruni. In the opening of My Hero Academia, Hakuyu Go was responsible for the cut with Eraser Head (which really reminds me of Atsushi Wakabayashi’s style), as well as some other minor cuts in some pretty plot important battles. Last but not least, Sakugabooru has him listed for cuts on Seraph of the End and Blood Blockade Battlefront. But all that speaks nothing to the style of these cuts. The influence from Yutaka Nakamura is rather obvious, Yutapon cube like wreckage and debris as well as robust, spare-no-expense animation. But I want to focus more on the Wakabayashi parallel I see. For a lot of people, Wakabayashi is a name that flies over their head despite being responsible for half of the amazing moments in Yu Yu Hakusho and Naruto. Atsushi Wakabayashi is a studio Pierrot veteran responsible for some of the greatest cuts the studio has ever produced. His work on Yu Yu Hakusho alone is worth the 112 episodes (and I’ve been thinking of of writing something on his style alone, consider this a primer). The fight in YYH episode 24 between the Masked Fighter and Shishiwakamaru feel very much like the cut above from 0:12 onward. One great tell is the darting in an out of the foreground, a Wakabayashi tell; another would be motivated camera movement, that is, the camera follows because the action demands it. Now having seen the amazing skills of Hakuyu Go, I can’t help but wonder where he will appear next. Aside from these two amazing cuts was the perfect inclusion of Reign into the whole mix, and his usage as a narrative tool to juxtapose childhood and being an adult. Often times the camera pans at a low angle, or colors him in such a way that causes him to feel superior to his situation, like a passive, responsible, hypocritical adult. The same goes for Ishiguro, the mysterious head of Claw’s 7th Division, bathed in bloodthirsty reds and a ‘melty’ formless cut that plays on his ambiguity in a Shinra Ohira fasion. It would also be a sin to forget Miyo Sato’s paintwork. Every time we see her work it floods the screen with texture, but this time her cut was contained within the line art of another artist, creating the perfect visual metaphor of building emotion – distraught blues turn to hostile maroons. This emotion then fills the screen like we are used to, but only before being slapped back to traditional animation by Reigen. It’s a peak of anime visual storytelling, one that should be examined and pointed to as a paragon for years to come. Mob Psycho is a show about emotions. And just as Mob learns what it feels like to willingly want to hurt another person (although he was provoked) an immediate and sharp consequence is provided. The show finds its voice that speaks loud and clear in the final scene, ‘this is what happens.’ But rest assured, Dimple will be back! I wanted to avoid talking about the cliffhanger, after credits scene from last week’s episode mostly because I was under the impression that Mob Psycho 100 would be stupid enough to try and pull off Reigen being the leader of Claw. It wasn’t that I actually thought Reigen was secretly a powerful psychic mastermind this entire time, but I honestly thought the show was going to go off in that direction to cheaply pull at everyone’s heart strings and present us with a final battle between Master and Pupil. Thankfully, I was wrong. Actually, the show pulled off an interesting narrative feat in this. Having the Con man, con the audience. It was fitting for the show to pull off a stunt like that. They used a character who was established as a liar, not that he uses his skills of deceit on the other characters in the story, but attempts to use them on the viewer. I admittedly spent a lot of time this week thinking about how the series was going to justify or spin Reigen into secretly being this badass psychic when I didn’t take the time to consider who he was from the get-go. In terms of twist, this is an easy one to see in hindsight, but in the moment it worked pretty effectively. This is also just a good Reigen episode. He’s a liar and a cheat, but he doesn’t want to see anybody get hurt. It was nice to see Reigen trick his way into saving the loser psychic kids and watching him stand up against the most powerful villains in the series for the simple reason of trying to protect Mob and his brother. As a character piece, this works pretty well. While we’ve had a few moments here and there that helped fight against the manipulative nature that was established for Reigen in the beginning, but this episode proves that Reigen is the best influence Mob could have. Unfortunately, this where those Shonen tropes I keep ragging on about pop up again. Well, maybe not so much Shonen tropes, but general anime tropes in this case. Making a character their most likable and at the highest moment of their glory and killing them off. Now I’m not a hundred percent convinced Reigen is dead, but that has to do with Dragonball forever screwing with my concept of fictional character death. That and the Spider-man Clone Saga with Gwen Stacy and the Jackal. Captain Scarlett ring any bells for anybody? Anyhow, I think Regain will be fine come next episode. Although we should be asking, ‘was this death effective?’ and ‘did it move the story in the right direction?’ Honestly, yeah, it kinda did. Mob’s voice of reason is gone. Will his psychic powers take him over the edge, or will he hang on to his last tether that ties him down with the rest of humanity? While this death gave character development to Mob and gave Reigen to shine in the spotlight without looking like a clown, I would instead pose the question, has this effective death scene too come too late for the series to recover? And unfortunately, I do think this happened a bit too late into the series for me to completely change my opinion about it. The path the narrative took to get here was so tedious and forgettable that it doesn’t really matter where we end up at this point. It’s about the journey, not the destination. This finale could be great, but I don’t think the trip to get there was worth it. Reigen lies at the heart of this show’s conscience and humor. Somewhat amoral himself, he know that his choices need not be the end all and be all. He makes no strides to better himself, but knows that others can be better in his place. And if he is bettered (financially) along the way, what’s the harm? He sees the good in Mob and has no desire for our young protagonist to see him as he really is, but instead as an idealized version himself so that Mob has a good example to follow. The level of competence Reigen displays in regard to this fluctuates wildly, of course, because his contradictory status as role model and scam artist lends itself to the show’s funniest moments. To that end, this episode is the culmination of the show’s heart and soul, both emotionally and comically. Even in the face of actual danger, he holds fast to his role as a guiding figure for Mob. Do not compromise your ideals, even in the face of adversity. That is exactly when you must stick to your ideal and devote yourself to them. Claw is putting the group in mortal danger and still Reigen, a totally normal person with no special powers, insists on being the adult and keeping Mob safe and on the safe path. For someone who (kind of) scams people out of their money professionally, it’s incredibly upstanding. Reigen is very much the “do as I say, not as I do” type but also strives to hold up appearances of being morally upright. I really like the entire cast of Mob Psycho 100, but Reigen stands out in more ways than one. “Morally complicated” is not a descriptor that usually accompanies “hilarious,” but Reigen manages both. And so, our penultimate episode draws to a close, and we may have ourselves a conundrum. Does Mob stand for Reigen’s ideals or does the show itself, an animation powerhouse that has had some of the most kinetic and visceral fight scenes I’ve ever seen, compromise this in service of spectacle? Mob himself seems intensely conflicted of how to proceed, torn between the immediate need and the moral high ground. Perhaps the show will split the difference or present some third option I’m unaware of. Regardless, I really can’t wait for the finale. This episode saved the show for me. After weeks of trudging through an awful, misguided arc that failed to play on Mob Psycho’s strengths I thought I would just wait it out to a naturally limp conclusion. Yet here, within the first five minutes of the episode proper, one character is reintroduced to get the series back on track: Reigen. God bless Reigen. If anything, he understands what is wrong with the past several episodes of this show. He sees all the pointless schlock that has motivated our cast to move into battle shounen territory and he confidently socks it right in the jaw. In one fell swoop he manages to take the thematic loose ends that we haven’t seen for nearly five weeks and tie them back to the present with finesse. He reminds us that Mob is no hero, just a misguided teen with problems socializing. He calls out the generic villains as being a bunch of stupid babies. He reminds Claw’s horde of goons to live for themselves, choosing what they think is right instead of mindlessly obeying the order of their superiors. Reigen represents everything that I loved about the early episodes making a last minute comeback. The ensuing battle immediately has more weight to it after this reframing of the plot. Instead of conflict hinged on “who’s stronger” the focus turns once again to Mob and his internal struggle to not harm humans with his powers that has been so quickly forgotten. While Teruki and Ritsu’s defense is technically impressive and exciting, the real meat of this battle is within Mob’s head as he stands uneasy, grappling with his mentor’s words and the desire to save his loved ones. This is exactly the kind of conflict the series thrives on, it’s what makes every click to 100% feel meaningful and justified. Mob’s mounting stress, represented through what is possibly the most effective Miyo Sato cut yet, overwhelms him like a dense, dark cloud, and just as he’s about to boil over something happens. Reigen’s hands slap his face. The darkness is exorcised. “You’re the one who’s going to suffer in the end.” The title card appears. It reads Master. This is the single most effective scene in this show yet. It almost makes me want to forgive its earlier missteps because of how well they characterize this moment. The way Reigen’s hands burst into the frame, pushing away the murky smears of Sato’s paint-on-glass, is simply brilliant and immediately effectual. The subsequent flashback scene is practically unnecessary after this exchange, though appreciated for offsetting the drama. Truly, if Mob Psycho were full of moments like these it would be a masterpiece. And then the episode ends, diving into next week’s finale on one hell of a cliffhanger and a single frame: 100%.